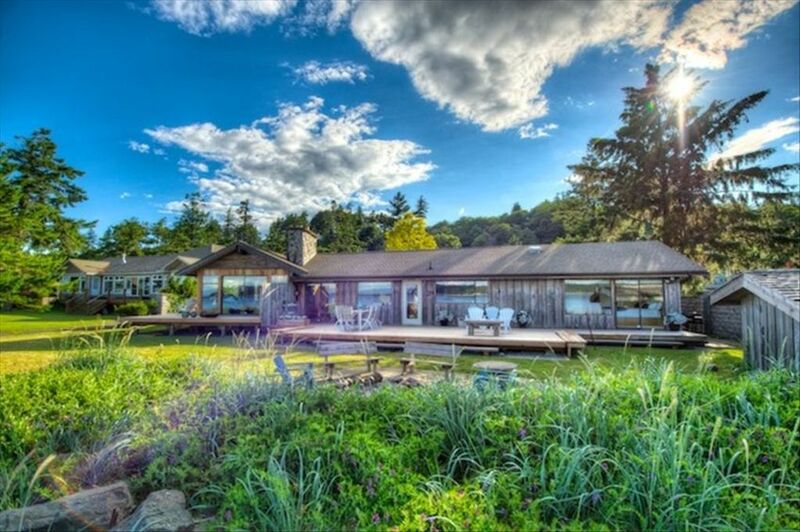 Bienvenue à l'île de Vancouver Beach House! Détendez-vous dans la double sa baignoire! Very welcoming property comfortably appointed with wonderful views of the ocean! The home has a very well equipped kitchen and lots of other things thoughtfully provided, such as games, umbrellas, fishing rods, and raincoats for rainy days. Nice touches such as fresh flowers and gentle music greeted us when we arrived. Central location made it very convenient to meet up with the fishing guide we had booked. Lots of places to sit and enjoy the view on sunny days, while the comfortable seating and expansive windows still made it possible for us to enjoy the location while curled up reading a book and watching the surf crash and the rain fall. We hope to get another chance to stay here again. Our party of four adults thoroughly enjoyed our 3 night stay at this wonderfully decorated, spacious ranch house.. with a beach front! The kitchen was fully equipped to prepare any kind of meal desired, including freshly caught fish from the ocean right out the door. The bedrooms were more than comfortable and the two soaker tubs were heaven. Tasteful pieces of art throughout the house were enjoyed and appreciated. Anna was there to greet us and offer any advice to make our stay in Campbell River perfect. Thanks for sharing your house, Anna. We definitely hope to return! We really enjoyed our few days on the ocean front although we hit Campbell River at it’s hottest week of the year with plus 31 C + temperatures so was hot in the house without a/c. The following day at + 25 C it was very comfortable. 95 % of the time a/c not required. I highly recommend this rental. Very well-appointed and tastefully decorated, beautiful views and big deck. Luxurious bathrooms. Excellent retreat, right in town. It was a surprise to me that the main road runs right by the front of the house, but once you enter through the gate, everything quiets down and the views and the calm take over. Anna is an excellent hostess. Dream House with a wonderful owner! We were a family of 5, my mother, my husband and my 2 children (3 and 6 years old) travelling from Trinidad. We absolutely fell in love with that property on the sea, so beautiful inside out. Very clean and welcoming, fresh flowers upon your arrival, you felt in a 5 star resort! The owner was so welcoming, as she saw us coming with no much warm clothes, she immediately ran into her house, and came back with sweaters and warm coats! Also she made sure to have plenty toys for my children, they were delighted! All these kind gestures were very much appreciated. The house is so beautifully decorated inside, it really makes you feel in holiday without having to walk outside! We also enjoyed lighting up camp fire outside where the children would roast marshmallows! Anna Cox was also so helpful in telling us where to eat, where to buy quality products, and all the different trails to visit plus directing you to the best tour operator for whale watching! We went with Go Wild and it was an incredible experience, we saw Orcas, Humpback whales, eagles and sea lions! All in one day! The eagles would also stand in front of the beach house, you can experience wildlife right in front!